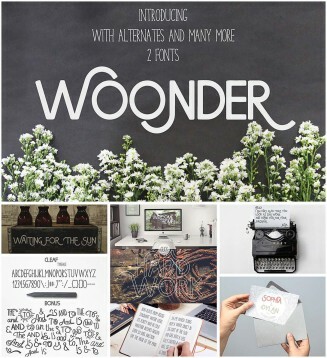 Introducing Woonder modern font with free catchwords. This handwritten fonts is perfect for: logos, wedding invitations, prints, quotes, stationary, decoration and etc. File format: .otf, .ttf, .ai, .eps for Photoshop or other vector software. Tags: brush, calligraphy, font, hand drawn, invitation, ligatures, logo, sans, sans serif, typeface.